Welcome to What’s For Dinner Menu Planning! It’s hard to believe we’re already on week 4 of the challenge! We have 10 more days of planning until the official October challenge ends. The challenge may be coming to an end but What’f For Dinner Menu Planning will continue as long as there are interested participants. What do you think? Should we continue with planning and sharing our menus? The family will pick me up at the airport and on the way home we will eat out. Leftovers and on-your-own on Monday. Go to the grocery store after work on Monday to get stand-by favorite meals. Quick. Easy and few ingredients. Saturday I will be back to planning a full menu. The winner of the Week 3 giveaway is Lisa at Smart Food and Fit! This week’s prize is generously provided by Dr. Rhoden’s Flavor Doctor. Flavor doctor allows you to minimize the use of salt in your recipes without compromising taste. With FlavorDoctor, We Can Do Both! Now it’s time to link up! Share the meals and recipes on your menu this week! Im not going to lie…I’m jealous. 🙂 I’m reading recaps all over the place and wish I was there! I already commented to Laura ——- keep it going!!! 🙂 I love that it helps keep me on track with planning my meals! It looks like the RW Festival was amazing – at least from all the pictures I’ve seen on Instagram. Can’t wait to hear more about it. I hope you are having a great time at the RW Festival! I have weeks like your quite often, but sometimes it works out better to just go with the old standbys ! Great job on your first vlog. 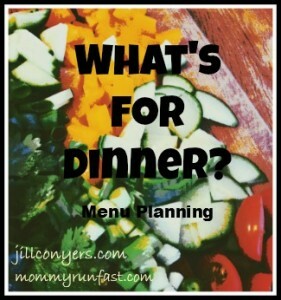 Love the idea of the meal planning, but I never seem to get beyond a day or two ahead in my own planning. So glad you ladies are having such a good time!! Can’t wait to hear more about your weekend! haha love the vlog! its nice to see you had a great time this weekend! Fun vlog! Are you on the top left? Loved seeing this Vlog on twitter, super cute! I hope to be part of the Fit Fluential team someday. I loved the vlog and your not-so-stinky socks! I have a friend running the RW half today.